Developed by the Laboratory of Brain Anatomical MRI, these tools allow users to process large multimodal datasets between subjects. 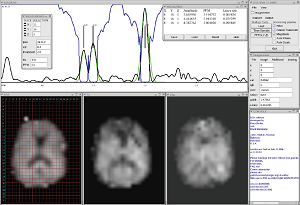 MRI Studio: This software package combines DTI analysis using DTI Studio, inter-subject co-registration with LDDMM using DiffeoMap, and drawing or editing regions of interest with ROIEditor. Note: When downloading and installing the different modules of MRI Studio, each software .exe is a .zip folder that contains the software application and an "Images" folder with the atlas templates. These atlas templates include the "Eve Atlas" in the folder "JHU_MNI_SS," featuring a single-subject female brain in Montreal Neurological Institute (MNI) coordinates, with contrasts from diffusion weighted imaging, T1-weighted imaging, T2-weighted imaging, the magnitude image of a gradient-recalled echo, and a quantitative susceptibility map. This "JHU_MNI_SS" folder also includes region of interest maps with the ".roihdr" extension, namely the "BPM" ("Brain Parcellation Map," with regions of interest drawn with reference to the Eve Atlas), the "EveDGMPM" ("Eve Deep Gray Matter Parcellation Map," with deep gray matter ROIs drawn using QSM contrast), and the "EvePM" (an atlas containing deep gray matter regions from the EveDGMPM and white matter ROIs from the BPM). The regions of interest themselves are labeled in the accompanying text document "Lookup Tables." If you are looking for information on the Eve atlas for Quantitative Susceptibility Mapping, please refer to our paper: Human brain atlas for automated region of interest selection in quantitative susceptibility mapping: Application to determine iron content in deep gray matter structures. Instructions on how to use the EveGreMag and EveRefQSM templates can be downloaded at the bottom of this webpage, from this link (Google Docs .pdf), or from this link (.pdf). MRIStudio: This MRIStudio software package incorporates the former DTIStudio, which can be used to load images, rotate volumes, create color maps, find tracts through a region of interest, etc. The BIRN site displays details about this particular tool, as well. Simulate CEST Z-spectra using Bloch Equations: Users can input several properties of the water pool, solute pool, and experimental parameters, then see how each variable affects the the Z-spectra. preprocess.m for SNR based thresholding and manually defining regions of interest (ROI) that will be analyzed in the next steps. B0map.m to produce a B0 map by pixelwise fitting the WASSR data sets collected. CEST_processing.m to perform quantitative z-spectral analysis on frequency-swept CEST data sets. The following actions are performed: 1) correct B0 inhomogeneities pixelwise; 2) display plots of the z-spectrum and MTRasym for a defined ROI; and 3) display MTRasym maps. A PDF manual and an example data set for the purpose of testing (phantom acquisition of 31.2 mM myo-inositol solutions in PBS with pH ranging from 5.0 to 7.8) are included. These software packages were developed by the Center for Imaging Science at Johns Hopkins University. CAportal: The Computational Anatomy Portal: The Computational Anatomy Portal provides access to the Atlases, Pipelines, Projects and Tools developed at the Johns Hopkins University Center for Imaging Science. Links are also provided to Computational Anatomy Processing Portals. Large Deformation Diffeomorphic Metric Mapping (LDDMM) Suite: These algorithms incorporate the volume, surface, similitude, landmarks, and DTI information in a dataset. CIS Software: Other packages from the CIS include a Rigid Landmark Matching (RLM) tool, CAWorks, BrainWorks, and MindView. XNAT is an open source imaging informatics platform, developed by the Neuroinformatics Research Group at Washington University. XNAT can be used to support a wide range of imaging-based projects to facilitate common management, productivity, and quality assurance tasks for imaging and associated data. The Center for Imaging Science presented a poster in 2011 with additional information for accessing XNAT in CA Works. These software packages were written by Peter Barker, DPhil. They are available for use on systems associated with the F. M. Kirby Center and the JHU Magnetic Resonance Division. Registered users may download them for free. The CSX program was developed for the display and analysis of in vivo spectroscopy and spectroscopic imaging datasets. Initially developed in the OpenWindows environment of Sun Microsystems SunOS 4.x on Sparc computers. Code compiled for Silicon Graphics IRIX6 system. The IMAX program displays images, and is to be used in conjunction with CSX. This program allows users to overlay images with MRSI "grids," with a "point-and-click" selection of spectra from regions of interest. Regions of interest can also be measured, added, subtracted, or combined. IMAX supports the following file formats: General Electric SIGNA (3.X, 4.X, or 5.X image files), DICOM, and SMIS (.sur). A general import tool allows the importing of data in other formats, such as ASCII, short integer, integer, floating point, double, and any header offset or matrix size. The DSX program combines the functionality of CSX and IMAX. It was based on the CSX processing and analysis code, but has a new graphical user interface (GUI). It was developed for x86 Windows and Linux systems. Developed by Drs. Peter Barker and David Bonekamp at Johns Hopkins Hospital in Baltimore, MD, USA. This software package was written by Richard Edden, PhD and John Evans, PhD of Cardiff University, UK. Gannet is a batch analysis tool for GABA-edited MRS, written in MATLAB (so it can be implemented in any operating system, so long as MATLAB is installed with Optimization and Statistics tollboxes). It is freely available to registered users through the blog http://gabamrs.blogspot.com. These subroutines and software for image analysis were produced by the SMART group. The SMART website contains downloadable subroutines for a variety of imaging analysis tasks as well as video tutorials on visualization and software usage. Fully automated cloud service for brain parcellation of MPRAGE images based on Multiple-Atlas Likelihood Fusion (MALF) algorithm, JHU multi-atlas inventories with 286 defined structures, and our Ontology Level Control (OLC) technology. Fully automated cloud service for DTI tensor calculation and extensive quantitative reports for quality control.